When we hired the plumbing/heating contractor to work on the new shower stall, we included a few other items in the job. One was replacing a radiator with a towel warmer, another was to install a second outdoor spigot because the original one ended up inside the greenhouse. Also included was the installation of a cap on the chimney that comes up from the ventilation hood over the kitchen stove. 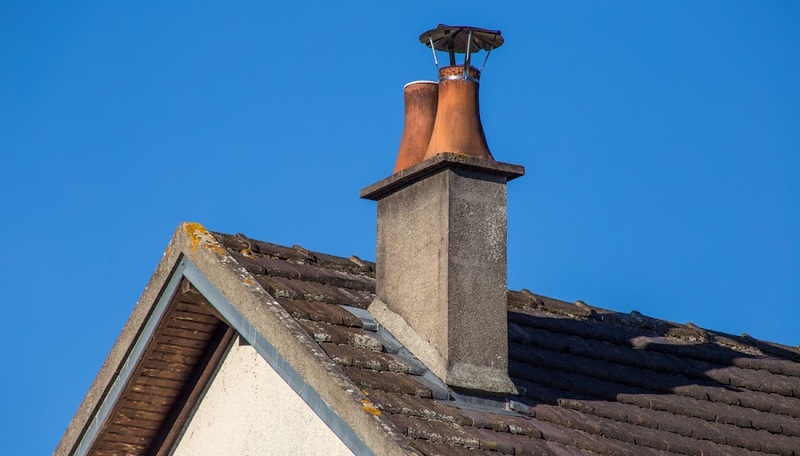 A chimney cap is called "un chapeau" (a hat) in French. There are three chimneys on this, the south end of the house. One was for the central heating oil-fired boiler. That one is no longer in service with the new condensation boiler that vents through a new "hole" in the side of the house. The second is a twin to the stove hood chimney. I'm not sure why there are two in the kitchen; we think there may have been a coal burning heater in there next to the stove, but the second chimney is not in use. The third is the one connected to the current stove hood. Our wood-burning stove has its own capped chimney on the north end of the house. We noticed last year, after a particularly hard rain event, that water seeped through the kitchen flue to the dry-wall where the stairs go up to the loft (close to the roof). We think that water got into the chimney, since they are open to the weather. So, the contractor sealed the two unused chimneys and added this cap to the third. These are not they. 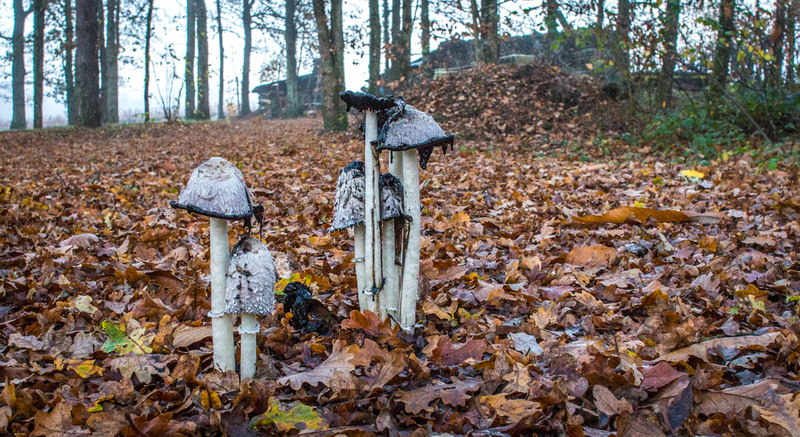 These are called coprin chevelu (coprinus comatus), known in English as "shaggy ink cap" and, while edible when they are young and totally white in color, they are not to be ingested if they show any pink or black at all. I never collect my own mushrooms, except from the market. Not having grown up learning about them, I would never trust myself to harvest wild mushrooms. As they say: "All mushrooms are edible. Once." I found these shaggy ink caps pushing up through the leaves near the artsy organized neighbor's piles of stuff. This morning is our first dip below zero this season. The sky is clear and the stars are shining brightly, and the temperature is just below freezing. It won't stay there for long, but it's not expected to get much warmer, either. This will be our pattern through the week. The constellation Orion is in full view out the western windows in the hours before sunrise. Well, we didn't go over the river first. But we did go through the woods. Callie enjoys the paths that wind around the clumps of trees. There is a lot to sniff in there. She normally leads the way and sometimes she'll get way out in front of me. But never too far. Callie notices when I stop to take a picture and waits to be sure I follow along. Patches of the woods around us get cleared periodically for firewood, but the trees quickly grow back. There are older trees around, especially on the steeper slopes, but many of France's forests are meticulously maintained. It's not unusual to see huge conifer forests where the trees are planted in long, regularly spaced lines. Saturday was foggy. It looked as though the world ended just beyond our back gate. Happily, it was all still there when Callie and I walked on through. While the fog was thick at ground level, it wasn't very deep (if deep is the right word). When I looked up at the sky, I saw blue. Heading out for our Saturday morning walk. Callie takes a little detour to sniff something. The fog stuck around into the afternoon, but then it cleared off and we had some sun before nightfall. Temperatures are cooling and we're expecting some light freezing in the next few mornings. This is the season for pumpkin pie. Given that we grew three good-sized pumpkins and nearly a dozen large sucrine squash (like butternut), we're looking for ways to use them. I made this pie for our Thanksgiving day with part of the rouge vif d'Etampes (Etampes bright red) pumpkin. We had one of those plants in the garden this year and it produced one pumpkin. I forgot to take a photo after taking the pie out of the pan. Oh well! I cut the pumpkin in half, scooped out the seeds, and roasted one of the halves in the oven. Ken's planning to use part of the other half for a tajine dish this weekend with leftover lamb. The recipe I use calls for two cups of the roasted pumpkin. I don't puree it, but rather mash it a little with a fork. I like little bits of pumpkin in the pie. Then I add some sugar, spices (cinnamon, clove, nutmeg, cardamom, ginger), eggs, and cream before pouring the mixture into the blind-baked pie shell. 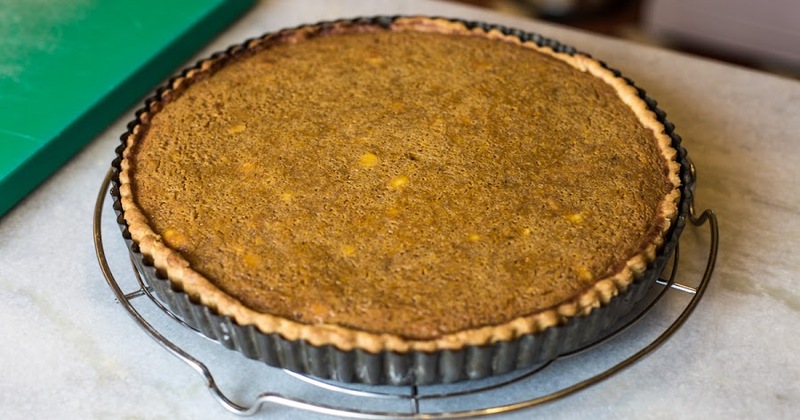 The resulting pie is rich and tastes of pumpkin. I usually reduce the amount of sugar and spices that the recipe calls for so that the taste of the pumpkin is not totally masked. We often just eat it as-is, but it's also good with a dollop of crème fraiche or whipped cream. I like sparkling wine. And the king of sparklers is Champagne. 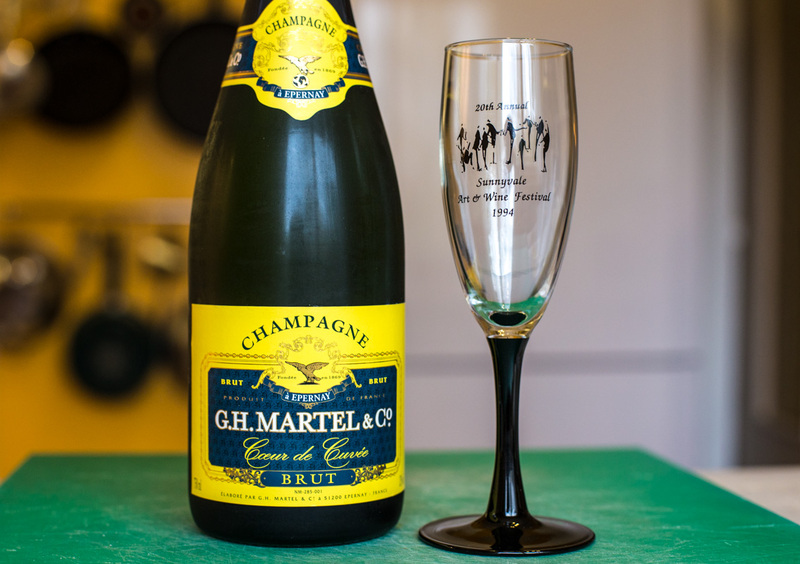 But Champagne is often quite pricey, given its reputation and some masterful marketing. So I've come to enjoy other, more affordable versions of bubbly wines. In California, many producers (whose parent companies are French) made excellent sparkling wines. Here in the Loire Valley region we have Vouvray and Saumur. 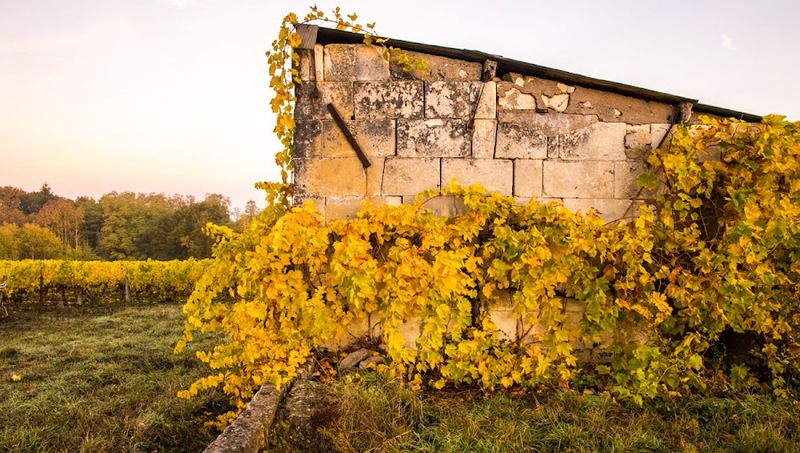 And right around us, most local winemakers offer what they used to call vin pétillant (sparkling wine) or méthode (named for the Champagne "method" but not allowed anymore because the Champagne people are protective of what they consider to be their proprietary vocabulary). Local sparklers are now called Fines Bulles de Touraine (Tiny Bubbles of Touraine). A little Champagne to get the holiday meal off to a sparkling start. Still, once in a while, especially as the end-of-the-year holidays approach, someone will have a sale on actual Champagne, so I stock up. And on Thursday, the US's Thanksgiving holiday, I opened one as our apéritif. It's a brut, or dry, variety, made with the traditional three grapes of Champagne: pinot noir, pinot meunier, and chardonnay. I also drank it with our first course of foie gras and preserved figs. The glass is one I got in California when we lived in the Silicon Valley city of Sunnyvale. It was 1994 and the twentieth edition of the city's annual Art and Wine Festival. We had two of these, but one of them broke along the way. I'm still using this one twenty-two years later. Or not. Many of you know that Ken and I don't usually eat turkey on Thanksgiving Day (a big American holiday). Our tradition for many, many years has been to roast a leg of lamb. We started doing this long before we moved to France where whole turkeys are not generally available until much closer to the Christmas holiday. This year, our leg of lamb has been boned, rolled, and tied into a roast, ready for the oven. These ingredients have nothing to do with turkey, lamb, or wings. They're from last weekend's pizza. But I'm out of new photos for the moment. Gasp! Yesterday, however, by chance, we may have stumbled onto a new tradition: turkey wings on the day before Thanksgiving. In recent years we've found chicken and turkey wings available in the supermarkets and we've learned how to make all kinds of wings recipes from the well-known Buffalo hot wings to Asian-style variations. Yesterday, it was turkey wings in the Buffalo Anchor Bar style, served with fries and a green salad. Delicious! Today is the third day out of four that I woke up at precisely 03h27 (3:27am). I know because I have a digital clock next to the bed. On the two mornings prior, I woke up at 03h33. There's nothing that I can identify that would wake me up at the same time so early in the morning. The heating system does not come on then, I can't hear trains in the valley with the windows closed. It's a mystery. The frame around the shower door was supposed to be stainless/silver, but the plumber ordered the wrong color, so we got white. Re-ordering would have taken more than two months. He agreed to a discount if we accepted the white. The new shower is basically done. The plumbing contractor packed up his tools and did a little clean-up yesterday. There's still some touch-up painting to be done by the tile guy, probably about ten minutes work. I spent a couple of hours washing down the old tile walls, the fixtures, and the floor. There was a lot of plaster dust. I also washed the windows. Today we will each use the shower for the first time. We're slowly getting moved back into the bathroom. Since there's a little less wall space than before, we have to make some decisions about storage and we're considering the options. The "old" pre-fab shower. It was new in 2005. So here is the "before" photo (above). 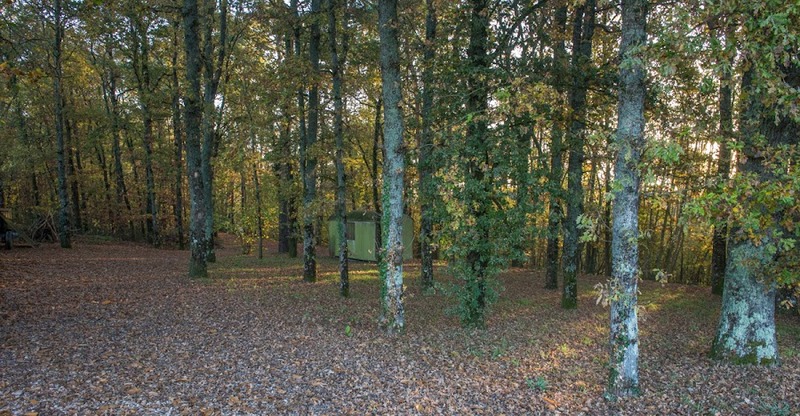 The pre-fab unit was 90cm x 90cm with a quarter-round corner cut out of it where the door was, and the seat took up some of the interior space. The new shower is 100cm x 100cm plus the bench, which adds another 26cm on one side, so there's more maneuvering room in there. I'll let you know how it feels. 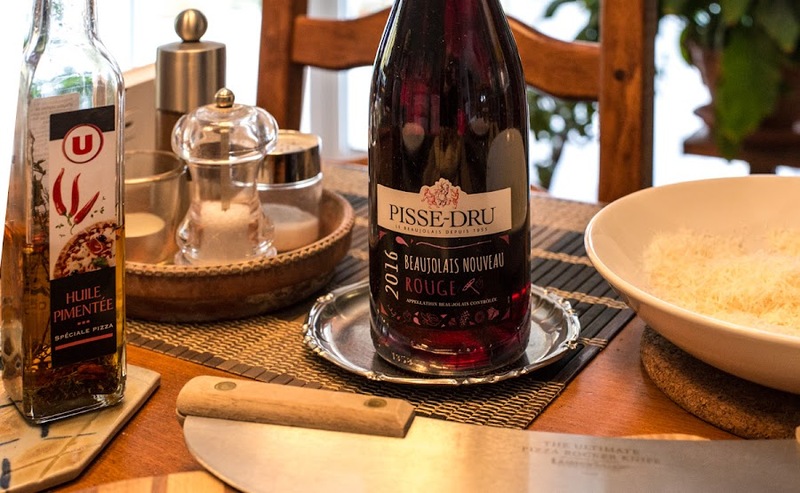 It's a funny name for a wine, and it kind of means what you'd think. 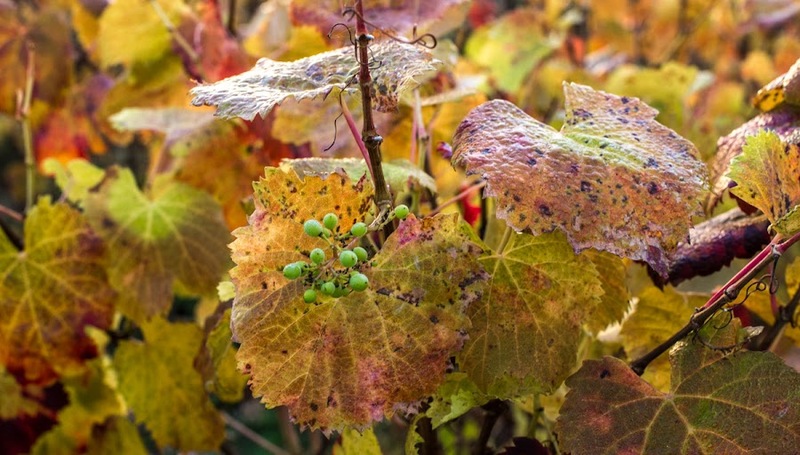 According to the producer's web site, the name represents what the ripe grapes seemed to be doing at harvest time, their juice bursting forth in abundance. Interesting imagery, to say the least. We drank a Pisse-Dru nouveau with our pizza on Sunday. On the left is a bottle of pizza oil flavored with hot peppers. But the wine is generally good. We're drinking this year's new wine and I find nothing to complain about. Except this: I've noticed over the years that Beaujolais nouveau is becoming more and more like the normal releases, almost indistinguishable (at least to me) from what might be sold later in the season. I remember drinking nouveau in the 1980s when it tasted thick and chalky, not at all like a finished gamay. That's what made it interesting. New wine was supposed to be unfinished, a preview of what the vintage might become later. 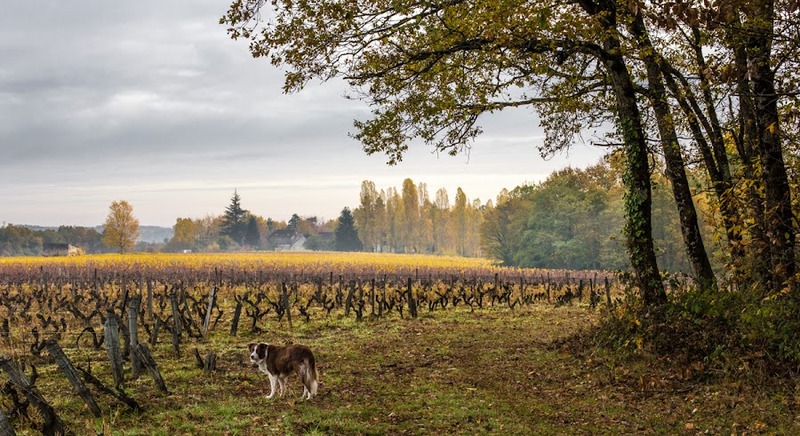 Perhaps the making of Beaujolais has improved over the years such that both the new wine and the regular release are much better than they ever have been. Or has there been a deliberate effort to make the new wines more palatable to sell more? I have no idea, of course, but if the new wine tastes just like the future release, what, then, is the point? 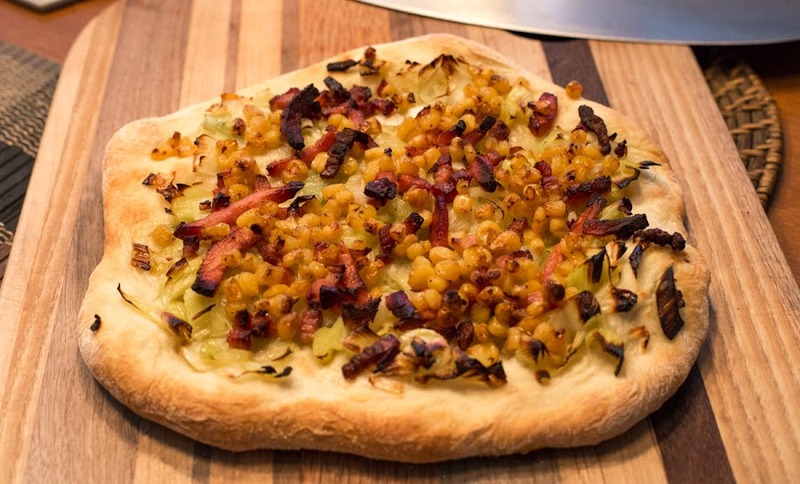 It's been a while since I made leek and bacon pizza, but it's one of my favorite pizzas. Sunday was the day. I sliced two leeks and sauteed them in olive oil. Then I cooked some lardons fumés (smoked bacon). Finally, we had a little bit of corn left over in the refrigerator, so I sauteed that, too. That's not a typical ingredient for pizza, but it was a very tasty addition. 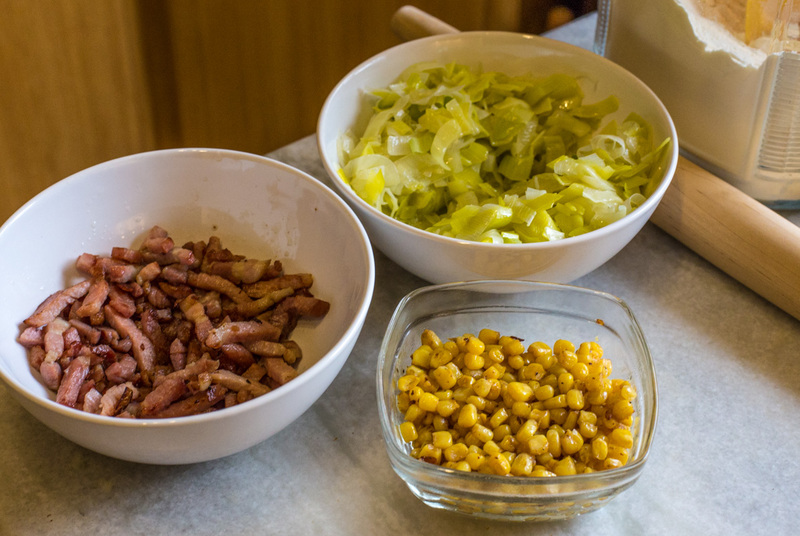 Pizza with smokey bacon, sauteed leeks, and some leftover sweet corn. I made my standard pizza dough the night before. It's the eighteen hour, no-knead dough from Jim Lahey's pizza recipe book. We sprinkled a little grated parmesan cheese on the hot pizza just before serving it. We're in the home stretch toward the completion of our new shower stall. The grout got done on Thursday, and the second coat of paint went up on the bathroom walls on Friday. There's still a little more painting and touching up to do. On Monday, the plumbing contractor will be back to install the fixtures (hot and cold water tap and shower head) and, we think, the glass enclosure. There's still detail work and some painting to do, but what you see in the photo is the final color combination. We will have a fixed, frosted glass panel on the end opposite the bench. That way, the view of the shower from the hall will be through frosted glass. 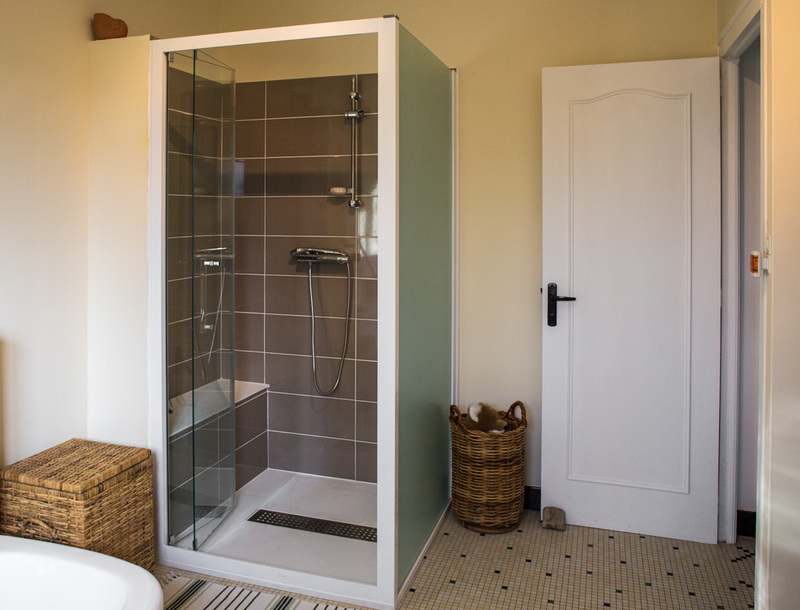 The shower door will face the bathtub (and the bathroom's window) and will be clear glass for maximum light. Once it's all together and we get our furniture back in there, we have some decisions to make about storage. More about that later. Well, not really. But with the wet and windy weather over the past few days, I have not got much accomplished out there. Add to that the work going on in the house and you can imagine that I'm not thinking that much about the outdoors right now. I was able to get the remaining vegetable plants pulled up and disposed of, and I got the hoses rolled up and put indoors for the winter. There were virtually no apples this year, so I haven't had to pick any up. Next year may be very different. We ate some of the dinousaur kale (you can see it on the lower left) this past week. Yum! But, rest assured, there will be breaks in the bad weather and we'll get out there and get things cleaned up before too long. The big job is the leaves. They're all on the ground now; the trees are bare. I'll get them raked up and spread on the garden plot at some point in the next week or so. We play this game every year and it usually works out. Wind gusts and rain squalls battered us through the night and are expected to continue through the day today. I suspect that we'll see the vineyard and many of the trees out there a lot barer this morning when it gets light outside. Such is November. So, here's another look at what things were like last weekend at the peak of the fall color. Golden leaves tinged with morning sunlight. The shower tile is grouted and we really like it. The tile guy recommended a couple of colors for the walls from some paint stock he had on hand. One color looked pretty good and we agreed to try it. I'm glad we did. It's called "gardenia" and it's a warm off-white that bridges the two tile colors in the bathroom very nicely. A second coat goes on today. The tile is up on the walls. And it looks pretty good. Today is grout day. Ken took some photos yesterday afternoon, but I haven't yet. Maybe today, once the grout is in. Then the plumbing contractor comes back on Monday to install the fixtures and the glass enclosure. We're getting closer to the finish line! An unusual sight: immature grapes in the fall vineyard. The days sure are feeling short now. Especially since we've been under a thick overcast for a while. There may be a "super moon" up there, but I'd prefer a super sun. Oh well, this, too, shall pass. Today is expected to be unseasonably warm, but windy. Maybe I'll get some work done outside. After a forty-five minute, last-minute, drive up to the tile showroom on Tuesday, we have decided that the tile we didn't think we ordered is actually the tile we did order. Both of us remember the tile we thought we ordered being more of an olive green color. But it's actually more of a beige color. We both scratched our heads when we were shown that no green tile exists and, even though the catalogue shows our tile as dark green (I did write in the catalogue that the tile we selected was lighter than in the photo), the tile we chose is beige. The color is called nuez which, in Spanish, means "nut." More orange and gold in the vineyard. Very little beige. So, after a week's delay in the shower construction, after I insisted that the tile people were wrong, and after Ken and I drove up there to prove them wrong, it turns out to be me who was wrong. We're going ahead with the beige-that-is-not-green. We did pick it out, after all. And we are in possession of it. Our tile guy (who has been very patient with us) is expected to come by this morning to lay the nuez tile. Sometimes you feel like a nut. This is one of those times. Not together. On Sunday we had a lunch of blanquette de veau (veal stew in a cream sauce) and on Monday a lunch of duck legs with glazed turnips. Today we'll have the veal leftovers. Both are classic French dishes and both are good fall/winter meals. The grape vines are losing their leaves quickly now. It's not really cold yet, but it's not warm, either. We're under clouds right now with rain off and on. I'm building a fire in the wood stove every afternoon; the central heating keeps the house warm in the mornings. Right now a thermostat setting of 18.5ºC (65ºF) feels good. We might need to increase that as winter builds in, but neither of us like the house to be too warm, especially over night. The wood fire gets the living/dining area much warmer than that, but the loft is cooler and that's where we spend the evenings and sleep, so it works out fine. Saturday morning was basically overcast, but there was a break in the clouds in the southeast just long enough for the rising sun to peek through during my walk with Callie. The vineyard is beautiful with layers of gold and brown right now. 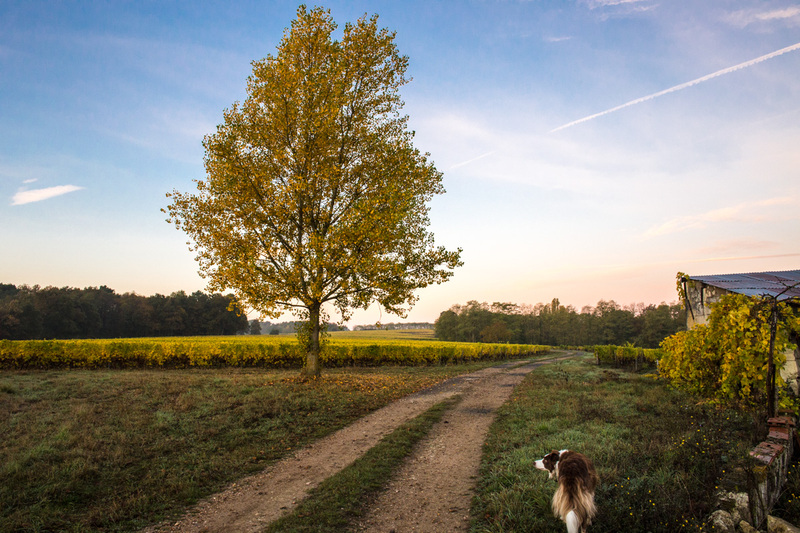 Callie likes to walk on the edges between the vines and the woods. Callie enjoys her extended back yard. One of the growers has already started pruning his vines. It seems early, but he's doing it. The vines next to where Callie is standing in the photo are pruned down to one cane. As winter comes, more and more of the vines will be pruned down. Here's the current view from our deck. 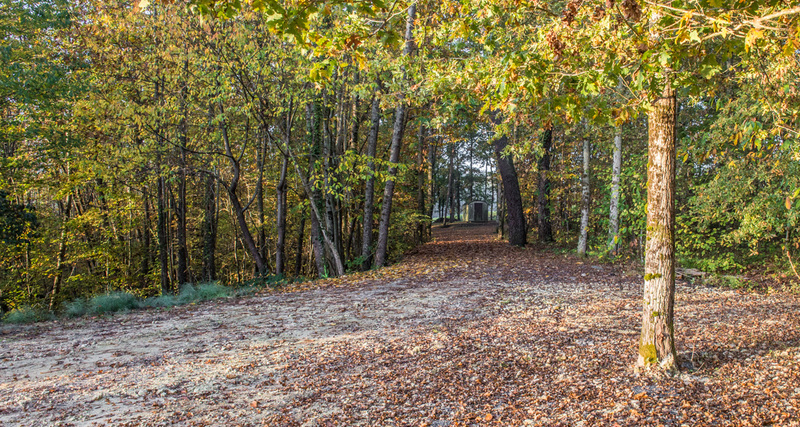 Many trees still have most of their leaves. Except for our two red (now orange) maples; they're almost done. It's time to get out there and rake. I'll spread the leaves on the vegetable garden to help keep weeds down over the winter. The view from our deck across the road toward our neighbors' property. 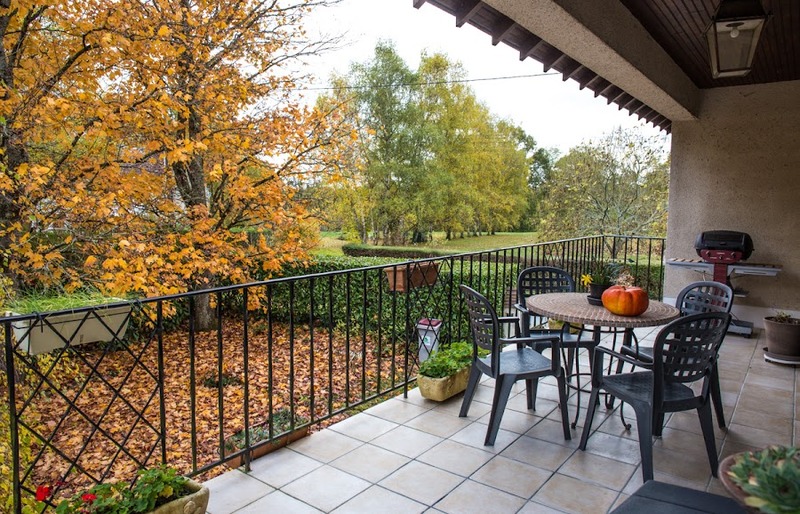 It's also almost time to get the table and chairs into the garage for the winter and to clean up and cover the barbecue grill. We've been taking plants into the new greenhouse, but we still have a few to move. There's no threat of a freeze any time soon, but as December approaches, the risk rises. Of photos, that is. I need to get out more with the camera, but it's difficult this time of year. The shorter days mean that I'm out with Callie when the light isn't particularly good. In the middle of the day when the light is better, we're busy with lunch (our main meal of the day). I don't like taking the camera out when it's raining, either. That's no fun. 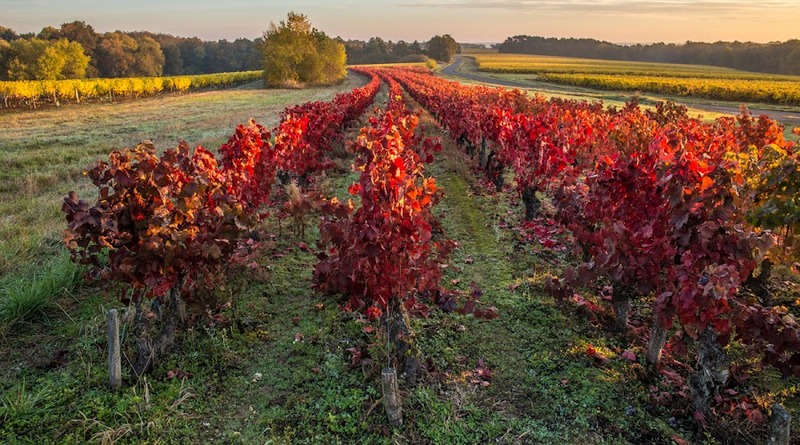 The leaves of different varietals turn different colors in the fall, as these two vineyard parcels illustrate. The moon will be full on Monday. Right now, it's big and bright in the evening sky (when there are no clouds). Callie barks at it, of course, the same way she barks at hot-air balloons. Then, when the moon is past full, it hangs in the morning sky until it sets. And Callie barks at it when we get outdoors. I worry that her morning barking might bother our neighbors, but no one has ever mentioned it. Today is a day off for many people in France as they remember the end of the First World War. It's just another Friday for us, but we don't get our regular bread delivery and the hunters will be out roaming the vineyards and woods looking for pheasants. Callie and I saw one just the other day while walking. The old storage building in the vineyard behind our house. The tile for the new shower came yesterday, but it turned out to be the wrong color again. This time it was not our fault. The boxes were marked with the correct color name and code as the catalogue shows, but the tiles inside were a different color completely. I'm not talking about subtle shades of the same color, I'm talking the difference between green and ivory. It's not rocket science. They're going to try to correct things on Monday since they're closed today for the holiday. Sigh. So yesterday, the tile guy finished building the bench inside the shower and the small wall that's part of the enclosure. I'm hopeful that the right tile will come and he'll get that all done during next week. The plumbing/heating contractor swept our chimney and cleaned the wood stove yesterday, so we're good for another year of fires. Wind and rain were the orders of the day on Wednesday. The house felt cold. It always does when a cold wind blows. I didn't build a fire because I thought the chimney might be swept yesterday, but it turns out to be happening this morning instead. Callie and I dodged frigid raindrops on our climb back up the hill in the afternoon. Too many of them hit their mark. A little blue sky on Tuesday morning. The tile did not arrive yesterday, but I got an email over night from the tile guy saying that it will be here this morning. The plumber informed us yesterday that he's away all next week. The finish line has been moved. The contents of our bathroom will remain piled in the guest room for a while longer. Callie is generously sharing her shower stall in utility room with us in the meantime. Woke up to rain and wind this morning. It's still dark outside. 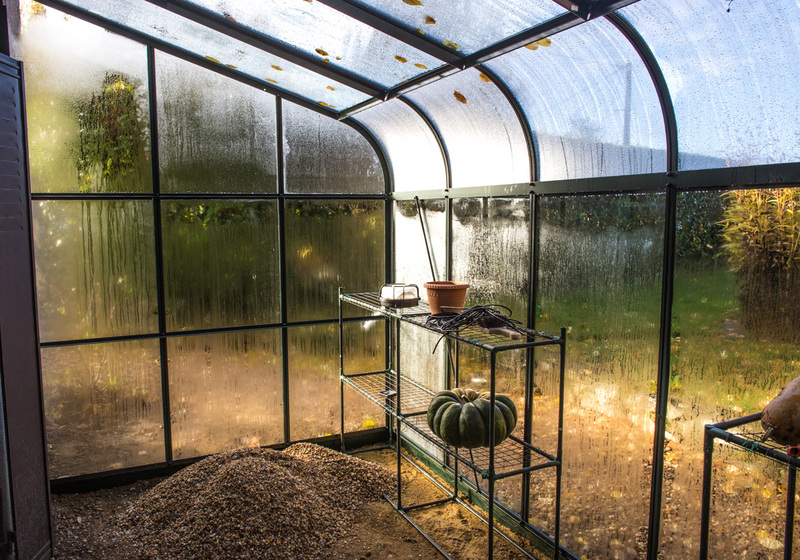 We put gravel on the floor of the greenhouse yesterday, but I didn't take any photos after we spread it around. We also put some plants inside for the winter. 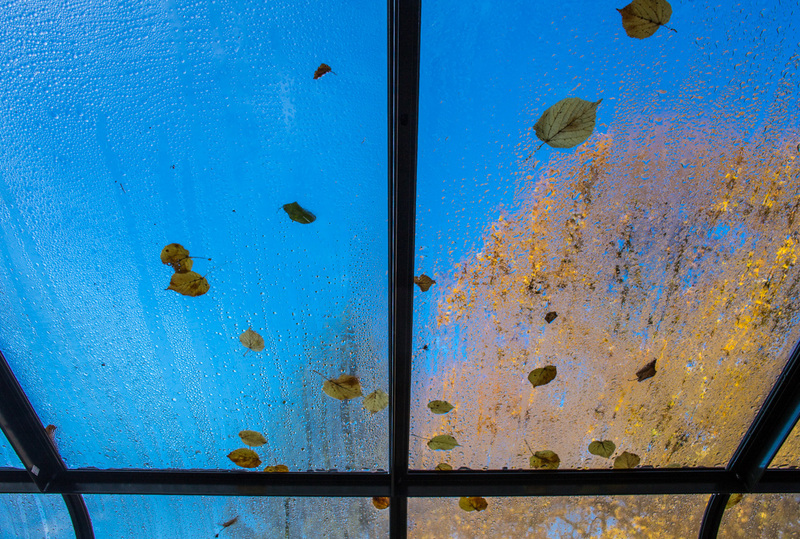 Lots of condensation on the greenhouse glass. And there's part of the gravel that we spread over the floor. We're expecting the shower tile to be delivered today, but are not sure when the tile guy will actually start laying it. Friday is a holiday here, so we may very well be into next week before the shower is done. Here's Callie at the beginning of her morning walk. It's her favorite part of the day. Along with treat time, lunch time, and afternoon walk time. And play time. And second treat time. And let's not forget nap time. The leaves are falling faster and faster now, and many of these are brown or gone since I took this photo last week. A nearby friend's fig tree has been very generous this year, and so has the friend by sharing her bounty with us. Ken has already done up two batches of figs in syrup for the freezer. Those will be delicious thawed out and eaten with holiday meats, including foie gras. On Sunday, I made another fig tart. 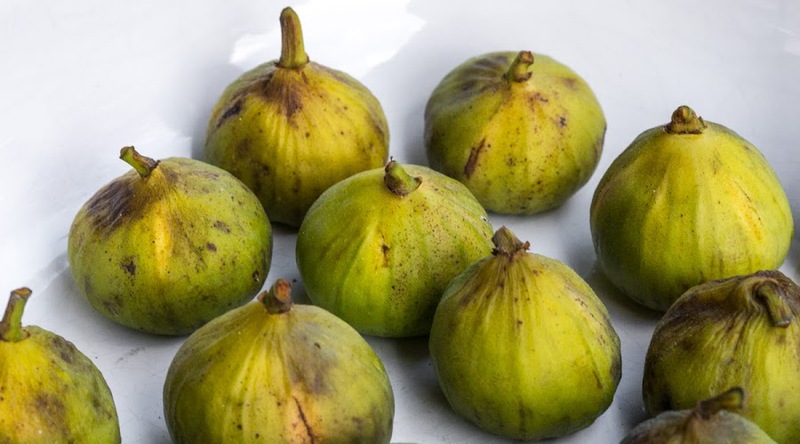 These figs were left over after I made a pie. We'll eat them some way or another. We're hopeful that we'll get the gravel we want for the greenhouse floor today. We found some that we wanted, but weren't prepared with containers to bring it home in. That particular building supply store doesn't sell the gravel in bags, but in bulk. Customers use their trailers (we don't have one) or other containers to transport it. We'll head over there this morning with our big bins. Not all the grapes in the vineyards get harvested. Some are left behind by the machines. Others grow on parcels that have been neglected for years. These are some of the latter, I think. The wildlife will appreciate them. I took this photo on Halloween. Those grapes may have been gobbled up by now. Since it's Sunday, there will probably be hunters out back this morning. They don't arrive until nine o'clock, so Callie and I will get our walk in before then. The hunters are a very civilized bunch. They hunt only on Sundays (and holidays) and they quit for two hours at lunch time. Then they're back again until the light begins to fade. Individual hunters are looking for game birds (like pheasant) and wild hare. For larger prey, like roe deer and fox, they hold organized hunts a couple times a month. 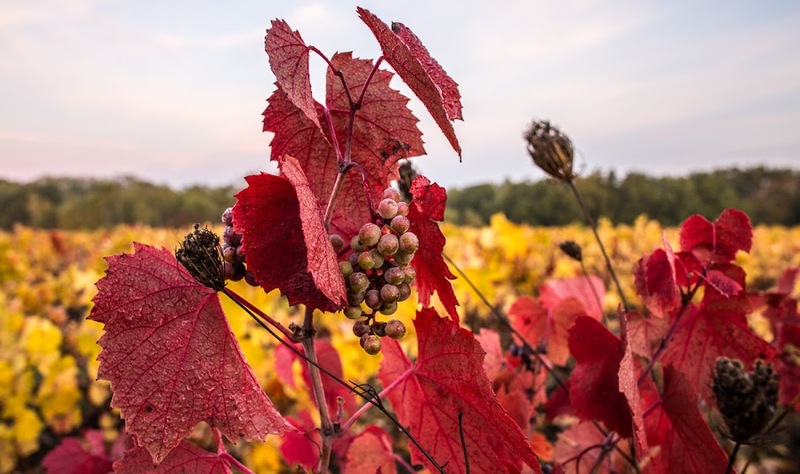 The rising sun on a fall morning highlights the orange, yellow, and golden leaves in the trees and on the grape vines. Here's Callie heading toward home on a recent morning walk. She'll cross the paved road and head down the dirt road between the trees. She knows the way, of course. The speed limit on the road to the right is 70 km/hr (a little over 40 mph). Luckily, Callie is very cautious around roads. We have a break in the construction work for a few days. First, it's the weekend. And second, the tile isn't expected until Wednesday. The plumbing work is done, for the most part, and the shower pan is installed. Ken and I are going to the home improvement stores this morning to look for some small-sized gravel for the floor of the greenhouse. Meanwhile, we had some rain over night. Hopefully it was enough to wash away the pollen that's been blowing off the big fir trees for the last couple of weeks. 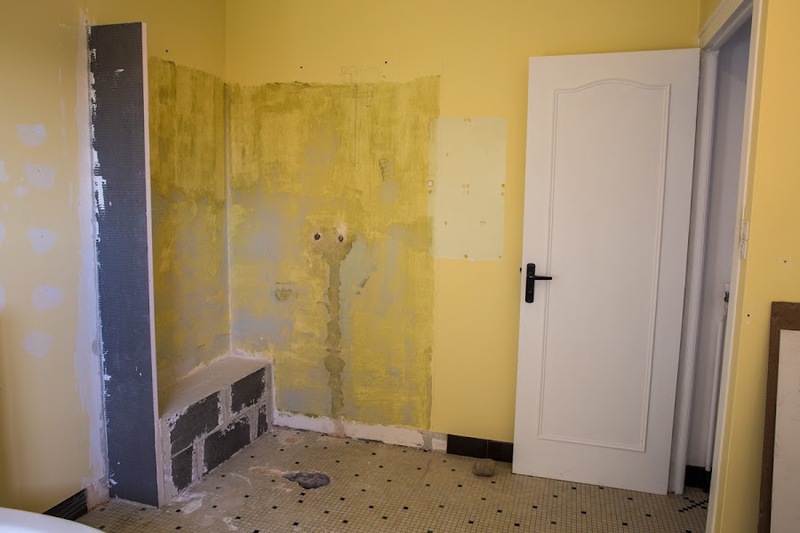 Here are "before" and "during" shots of the construction of our new shower stall. Believe it or not, when we bought the house, there was no shower in the bathroom. That corner was completely empty. There was a tub, of course, and a sink and a bidet, but no shower. 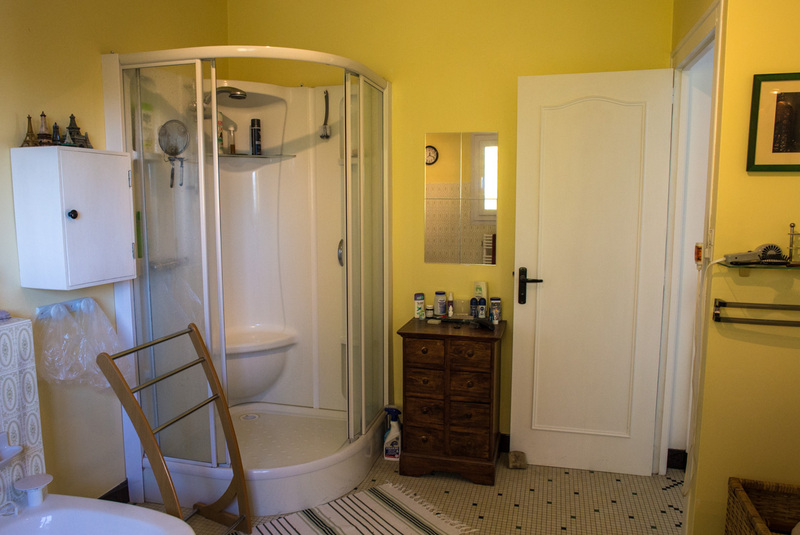 We have a small shower stall downstairs in the utility room and we used that for the first two years. It was fine in the summers, but quite chilly in the winters. We're using it again now. The old pre-fab unit is now history. Before 2005, this space was empty. 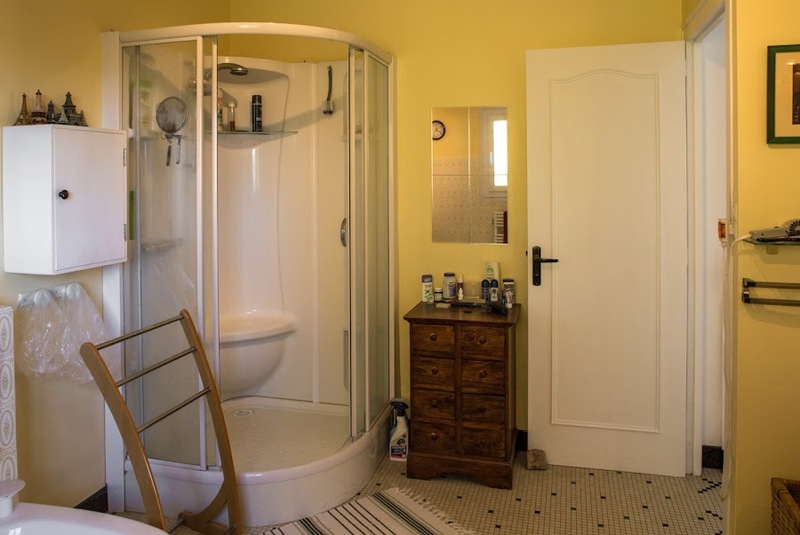 In 2005, we found a plumber (who has since retired) to install a prefabricated shower stall unit in the empty corner of the bathroom. That required bringing hot and cold water up from below and running a drain pipe to take away the used water. The stall was nice. It looked like something from a space ship. Shiny-white plastic and curvy glass. Very sleek. But lately it was showing signs of age and several cracks had appeared in the plastic; we worried about leaks. And we wanted something a little larger, as well. The new shower stall takes shape. You can see the new drain hole in the floor. The dark stuff on the yellow wall is a coat of waterproof primer. So, we decided to have a larger stall built and tiled in rather than go for another pre-fab unit. The demolition started on Wednesday with the old unit being dismantled and taken to the dump. Then the plumber drilled new holes through the floor for hot and cold water pipes and the new drain. He had to carve a channel into the concrete-block bearing wall for the water pipes (it's already been filled in in the "during" photo above). The tile guy built the shower bench and the little wall next to it yesterday. Today they'll lay the shower pan and connect the drain. The tile work will be done next week (once the tiles of the correct color arrive). 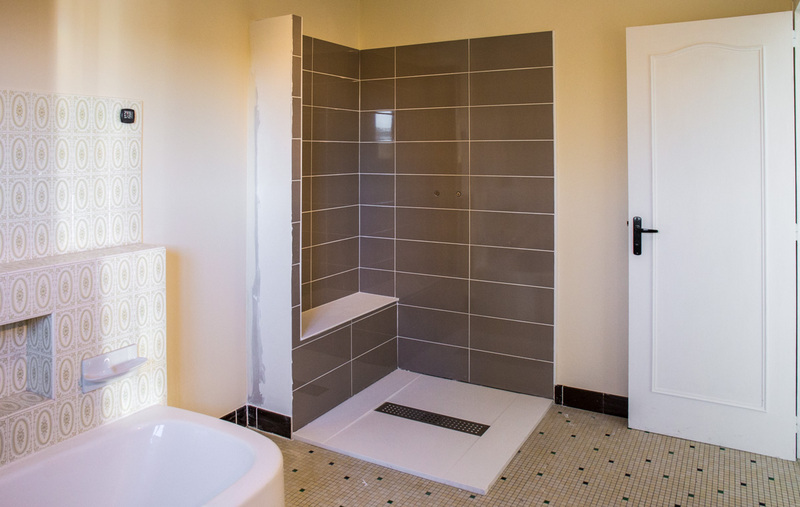 After that, the fixtures will be installed and the rest of the shower will be enclosed with glass. Then the whole room will get a fresh coat of paint. These house projects are doing a job on my nerves. Intellectually, and in reality, everything is fine. Emotionally, I'm a wreck. Having contractors arrive early in the morning to spend the entire day, leaving at or after sunset, really cramps one's style. Worrying about weather, listening to demolition, hearing ear-splitting drilling through concrete for what seems like hours on end. Ugh! Not to mention the stress of watching the value of the dollar fluctuate as we move serious sums of money from the US to France to pay for things. In addition to this work, we also pay our taxes this time of year, and we buy heating oil, too. It all adds up. Where's that peaceful easy feeling? I spent a good deal of time with the plumbing contractor yesterday discussing the details of how I wanted things to look in the end, all in French, of course (I learned about PER, polyethylene reticulated pipe. Say that three times, fast, in French). I think we're all in agreement now. Then I found out that I ordered the wrong color tile for the shower, after it arrived. I gave the tile guy the right name for the color, but got one of the letters in the product code wrong. Unfortunately, he went with the code instead of the name. Fortunately, we noticed my error before the boxes were opened, so he should have no problems exchanging them. I felt like a dunce. Callie has a grooming appointment this morning and I have my normal six-month doctor visit on Friday (just routine to renew prescriptions). Then there's this US election thing... Deep breaths. Deep breaths. This is the path through the artsy organized neighbor's property next to the vineyard parcels out back. He has a nicely graded dirt road that ends at the edge of a deep ravine. A smaller, less maintained path dives down into the ravine itself, possibly connecting to the paved road that runs on the other side of the stream bed down there. I wonder if he lives in one of the houses down there or somewhere else. The "road" ends here. 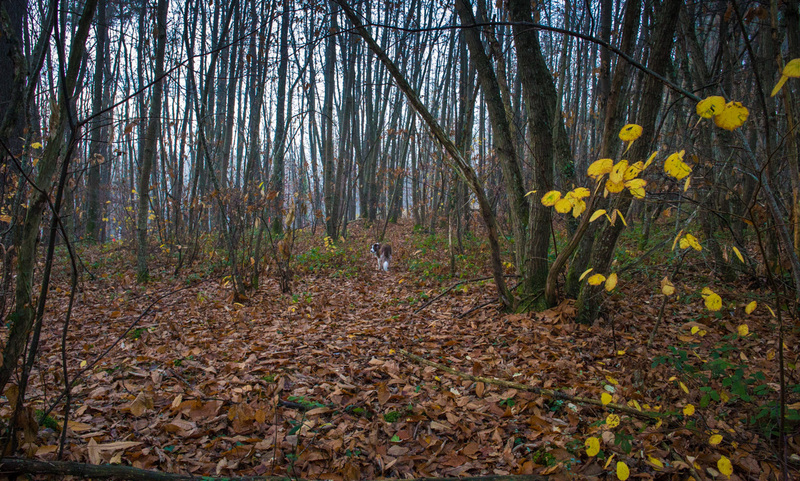 Behind where I'm standing, Callie and I walk on a small deer path through the woods. The greenhouse is done! Well, the assembly is done. Ken and I have some ideas for finishing the floor, and we need some greenhouse "furniture," that is shelving and a potter's bench. We're very happy with the work, so far. No glaring errors, nothing broken, it all seems right. Time will tell. Demolition work begins today on the old shower stall. We had our first relatively clear morning in more than a week on Monday. There was no fog as the sun came up, but there was a thick haze. I wanted to get another wide shot of the far vineyards before all the color goes away. It's not exactly what I was hoping for, but it's close enough. Scroll down to last Friday's photo to see the difference. The mornings are getting colder, but it's still not raining. That's good for now because the guys are coming back this morning to finish up the greenhouse installation. I hope. Today is a holiday in France, but they're going to come anyway. The young guy is doing this as a side job to his regular landscaping work so he's been here on Saturdays. I don't know what his father does (he may be a grape grower/winemaker because his last name is well known around these parts). They thought they'd be done last week, and I'm sure they are anxious to finish up. Keep your fingers crossed!